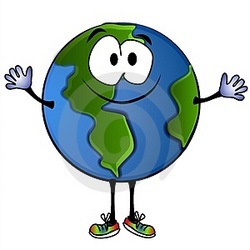 Earth got its name from German word for ground. The distance from sun to earth is 1,496,000,000km. Earth’s size is 6,379km. It has a Moon. Twenty four hours make one day on Earth. It is made of an inner core, outer core, mantle and crust. They are made of (Crust: SiO2-57-58 %, Al2O3-16%, FeO-6-9%, MgO-4-5%, CaO-6-7%, Na2O-3%, K2O-1-2%, TiO2-0.7-0.8%)(Mantle: Olivine, Spinel, Garnet)(Inner Core: a solid iron-nickel alloy. )(Outer Core: molten iron and nickel.). The air isnitrogen (78.09%) and oxygen (20.95%). The remaining 1% is made up of argon (0.93%), carbon dioxide (0.039% as of 2010) and other trace gases (0.003%). The weather is humid. Average temperature in earth is 15ºc. Earth has volcanoes, valleys, mountains, etc.